On a hydraulic fracturing job site, the sand king is a critical piece of machinery at the heart of the stimulation operation. It “feeds the beast” by taking proppant from an endless cavalcade of trucks so that it can be conveyed to blenders and mixed with fluid for pumping down hole. It is the final link in a long and winding proppant supply chain that typically originates in Upper Midwest states with no oil or gas reserves, but massive deposits of a resource essential to producing unconventional formations: high-purity silica sand that keeps induced fractures propped open and hydrocarbons flowing from low-permeability rocks. Wisconsin’s 44 active mines account for nearly half the nation’s total installed frac sand capacity, according to Thomas P. Jacob, a senior research analyst in IHS Markit’s upstream research division. In the realm of frac sand mining, the Badger State is undisputed king. The quartz-rich northern white sand sourced within its borders–and to a much lesser degree, neighboring Minnesota and Illinois–has long demanded a premium price in shale plays. “Its physical properties make northern white ideal for well stimulation,” he says. At any point in time, odds are that unit trains being loaded with the “good stuff” at central Wisconsin mining facilities are destined to ride the rails for the long haul south to the Permian Basin–far and away the biggest frac sand consuming market. Industry metrics indicate that Permian proppant intensities now are averaging on the order of 1,900 pounds (nearly 1 ton), but are as high as 5,000 pounds (2.5 tons) per lateral foot. A run-of-the-mill Wolfcamp horizontal consumes 12 million-14.5 million pounds (6,000-7,250 tons) of proppant, requiring a logistics infrastructure on the scale of 300 truckloads to service a single well. Given the efficiencies of multiwell pad operations, a single frac crew can place down hole 6 million pounds or more of sand a day, emptying 130 dry bulk trailers every 24 hours. 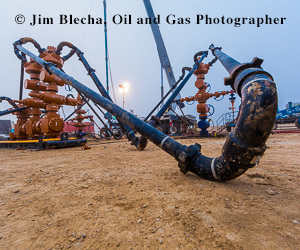 These trends are particularly evident in the stacked tight oil plays in the Delaware and Midland sub-basins, Jacob observes, distinguishing the Permian as the reigning king of frac sand demand. By IHS Markit estimates, he says West Texas accounts for 37 percent of all U.S. proppant demand, putting away more sand every day than the next two largest consuming basins–the Eagle Ford and Marcellus/Utica–combined. The logistical catch is that Google Maps shows that 1,313 miles lie between Chippewa County, Wi., and Midland County, Tx. A cardinal rule in logistics management is that the supply chain grows increasingly complicated the longer it stretches, the more volume it must deliver, and the faster it must move. So how much demand pull is at the end of the line in the West Texas, and how quickly are Permian horizontals churning through frac sand supplies? Given increasing well sizes and proppant densities, IHS Markit estimates that Delaware and Midland basin operators will consume 50 billion pounds of proppant this year–doubling 2016’s total and quadrupling 2014’s gross amount (Figure 1). That breaks down to 137 million pounds (68,500 tons), or the equivalent of more than 600 railcars (four standard 150-car unit trains) worth of sand every day of the year. Looking forward, Jacob says Permian demand is expected to maintain its upward climb, reaching 119 billion pounds by 2022 to account for 40 percent of the total projected amount for all U.S. shale plays. At that forecasted level of consumption, Permian operators would be pumping proppant at a daily rate of 326 million pounds (163,000 tons, or enough to fill 1,500 railcars/10 unit trains). In short, the Permian has been–and is forecast to remain–the ultimate growth market for frac sand, according to Jacob, who notes that it was the lone region to grow proppant demand through the darkest days of the 2015-16 activity downturn. To streamline supply-side logistics and reduce delivered costs, he reports that a long list of companies is working to make West Texas a new frac sand supply epicenter by opening mines right in the backyard of North America’s hottest horizontal resource plays. IHS Markit counts 17 active “brown sand” mines in operation across the Lone Star State (mostly in East and South Texas), but has identified a roughly equal number of new in-basin mines that have been announced within the greater Permian’s Central Basin Platform that separates the Delaware and Midland sub-basins. Incidentally, some of the West Texas mine sites are owned and operated by the same companies mining northern white in the Great Lakes/Upper Midwest. Looking at activity trends as tracked by IHS Markit, it is easy to see why proppant suppliers are eager to expand capacities. Driven by activity in West Texas, Jacob says IHS Markit predicts that U.S. drilling and completion activity will build on the momentum of 2017, when the number of well spuds jumped 61 percent and the number of horizontal wells hydraulically fractured soared by 57 percent year over year (Figure 2). Over the coming 12 months, IHS Markit estimates that operators will regulate the drilling pace to allow completions to get caught up, projecting the number of new wells to decline modestly and the number of horizontal wells fractured to increase slightly compared with 2017, Jacob reveals. Longer term, however, he says IHS Markit forecasts healthy year-over-year growth in the numbers of wells drilled and fractured, returning annual horizontal well completion counts for 2019-22 to levels roughly on par with the 2012-14 timeframe. For an industry hoping to finally break into a sustained recovery mode, consistent activity levels, fewer DUCs and new investments in fracturing horsepower are all welcome news. However, Jacob points to two prominent trends largely defining future well completion activity in IHS Markit’s analysis: The total numbers of frac stages in horizontal wells, and proppant volumes pumped per well, which surged by 76 percent and 28 percent, respectively, through the first part of 2017. Jacob credits EOG Resources Inc.’s Eagle Ford team with pioneering the slickwater frac designs with high proppant concentrations quickly that have become the de facto standard in shale plays. “There is always a set of operators at the forefront, and then everyone else eventually follows. We think part of the exponential increase in proppant intensity levels indicates that the rest of the market is catching up with the leaders,” he offers. These trucks are loading at the first in-basin sand mine serving the Permian Basin. Hi-Crush, the mine’s operator, says the Kermit, Tx., facility can produce as much as 3 million tons of high-quality fine mesh sand a year. The golden opportunity to serve booming local demand explains why companies are lining up to build new fine-grade frac sand capacity in West Texas. The gross announced annual capacity of all the proposed brown mines is almost 70 million pounds (all of it either 40/70- or 100-mesh), which Jacob says probably far overshoots the required need. Looking at American Petroleum Institute specifications such as sphericity and turbidity, Jacob says northern white sand has a crucial advantage over brown sands: greater compressive strength and higher crush resistance to keep fractures propped as wells produce. The biggest disadvantage is cost. About half the delivered cost of northern white in the Permian can be attributed to rail transportation. IHS Markit estimates that the median delivered cost of Texas brown sand will be $78/ton this year for the Delaware and Midland wells, he says. Moving the point of origin from 1,300 to 30 miles away from the well not only simplifies logistics and reduces delivered costs, but may promote the concept of real-time treatment optimization, Jacob predicts. The increased availability and lower costs could benefit operators in the Marcellus/Utica, Bakken, SCOOP/STACK and other plays that consume northern white sand, Jacob adds. Precisely as in the Permian, with its newfound supply of local brown, Jacob says break-even costs ultimately may fall in other basins that use northern white, considering that proppant can represent as much as 30 percent of total completions costs. As long as operators favor completion designs that combine fine mesh sand with coarser grades, unit trains will continue carrying premium northern white sand into the Permian Basin. By augmenting this traditional premium sand with locally-mined fine reserves, sand providers say they can simplify proppant delivery logistics and reduce completion costs. As more West Texas sand mines come on line, they may reduce the Permian’s need for fine mesh northern white, allowing some to be sent into other demand centers, such as the Marcellus and Bakken. The first Permian Basin sand mine, which is located near Kermit, Tx., opened in July and reached its nameplate capacity of 3 million tons a year in October. According to Hi-Crush, the operator, the mine’s reserves contain 105 million tons of high-quality fine mesh sand. In-basin sand mines mitigate the need to put sand onto a train, ship it to a terminal and unload it into storage silos, Rasmus details. “Depending on where the alternative sand is coming from and the types of services used to transport it, this could reduce costs by 25-40 percent,” he calculates. Despite those savings, Rasmus says northern white will continue to play a vital role in Permian Basin completions. “Most Permian Basin sand deposits are primarily 100 mesh. While there are a few operators who complete wells using almost entirely 100 mesh, most prefer to combine it with other grades, particularly 40/70,” he argues. The Permian’s 100-mesh sand has quality comparable to northern white, but at the 40/70 grade size, Rasmus says northern white retains its traditional edge. Because it has a more even distribution across the sieve, with a mix of 40-, 50-, 60- and 70-mesh sand grains rather than a high concentration of fine mesh sand, it is more attractive to most operators. Thus, Rasmus predicts many Permian operators will continue to buy northern white. With that in mind, he says Hi-Crush made the decision to produce only 100 mesh sand at its Kermit facility. “Producing one grade simplifies the production process and reduces the facility’s infrastructure needs, creating cost savings we can pass on to customers,” he comments. To provide supply surety, Rasmus says some of the best sand mining companies are investing in logistics infrastructure and expertise. For Hi-Crush, that effort has included leasing railcars and building Class I rail terminals in the Permian Basin, Marcellus/Utica and other regions. “By owning and operating terminals, we can eliminate middle men, which reduces costs and gives the customer one point of contact and accountability, improving customer service,” Rasmus explains. According to Rasmus, both sand providers and railroad companies are looking to expand the amount of sand delivered by unit train. “Unit trains are three-four times faster than manifest trains and easier to manage for both the shipper and the railroad company,” he says. As part of their logistics offerings, a few sand providers are helping operators move sand from the terminal to the well site. Instead of using pneumatic trailers to deliver and unload the sand, Rasmus says Hi-Crush employs an innovative containerized system that can be transported on flatbed trucks, which are more common and affordable. These containers have funnel-like openings at the bottom that allow them to empty by gravity onto a conveyer belt or directly into the hopper, providing fast-unload capability. Importantly, the fully enclosed container system eliminates more than 90 percent of the silica dust emissions associated with traditional pneumatic methods, enough to comply today with U.S. Occupational Safety & Health Administration limits on silica dust exposure that will go into effect in 2018, Rasmus reports. He adds that the solution is much quieter than pneumatic trailers, a boon in areas where wells are near homes and businesses. Rasmus adds that the containers can be delivered to the site ahead of a project, enabling operators to guarantee sand availability and spread truck traffic out to minimize inconveniences to local communities.